Beginning of tab section with 2 tabs. Left and right arrow keys will navigate between tab navigation links. 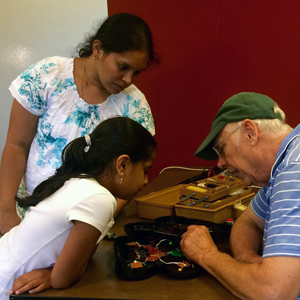 At Fix-It Clinics, residents bring in small household appliances, clothing, electronics, mobile devices and more to receive free guided assistance from volunteers with repair skills to disassemble, troubleshoot and fix items. Fix-It Clinics build community connections and reduce the number of repairable objects that are thrown in the trash. Back to tab navigation. End of tab content.